Identify the key conditions of self-reproduction of the socioecological system of the island of Samothraki, as well as the main drivers of transformation. Reconstruct the current system’s compartments and dynamics, in order to make recommendations on how to avoid critical tipping points at present and strive for a sustainable future. Guiding paradigm for understanding the self-reproduction of socioecological systems is a model of interaction between cultural and natural spheres of causation. In the realm where these two spheres interact, namely the hybrid (that is, both naturally and culturally governed) compartments of the system, we deal with a stocks and flows model. The system and its various compartments reproduce themselves as long as the flows required for maintaining the stocks can be organized. The figure gives a comprehensive overview of this model. 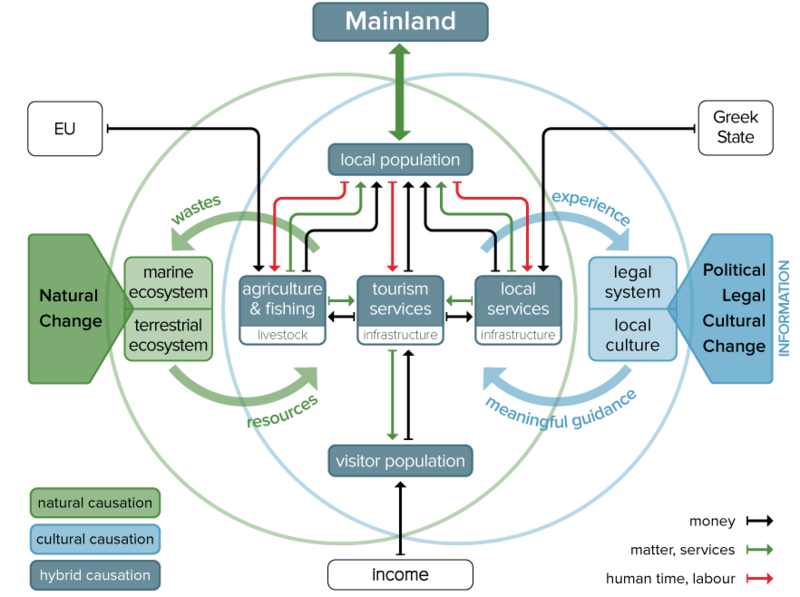 The centre is occupied by the core (hybrid) compartments of the socioecological system on the island: the local population, the visitor population, and the three key economic sectors including the biophysical infrastructures these sectors require and maintain (in the case of agriculture: the livestock). The local population invests labour into the economic sectors, and receives income and services in return. The visitor population brings money from outside, and receives services in return. All economic sectors draw on certain resources from the marine and/or terrestrial environment, and gene rate wastes in return. The behaviour of all actors is guided by the island’s legal and cultural system, and this system in turn may incorporate new experiences. In July 2016 we launched the FWF funded project CiSciSusaki (Citizen Science Sustainable Samothraki), an extension of the ongoing SuSaki project and aims at including Samothraki citizens more into our ongoing research process. Citizen science strategies complement traditional scientific and educational approaches in multiple ways. On top of helping reduce excessive travel from the part of the researchers, they bring about improved outcomes by establishing a joint knowledge ownership with local people. The current conditions on Samothraki are particularly favourable to the application of citizen science strategies. In September 2017 we launched the SamoMAB project that is funded by the Austrian National Committee of UNESCO´s Man and the BiosphereProgramme (MAB). The project builds upon the achievements of a long and successful research process initiated by the Austrian MAB committee and realised by the Vienna Institute of Social Ecology (SEC), for creating a new Biosphere Reserve (BR) on the Greek island of Samothraki. At the start of the project we had reached a momentum, where we finally saw our efforts bearing fruits, but that was also critical in the sense that certain institutional constraints needed to be overcome to achieve full designation. Nevertheless, the commitment of local actors and the long and expanding scientific support, safeguarded that the process was not stalled – under the condition that there exists additional seed funding. In this respect, the SamoMAB project becomes instrumental in capitalizing on the emergent momentum, preserving the current achievements and supporting the local administration in finding and applying sustainable solutions in two key priority areas: waste and water management, as well as a functioning conservation management. Beyond the single case, the project intends to continue consolidating the experience and outcomes of the process in developing management guidelines in order to promote BRs as learning sites for sustainable development in the Mediterranean and Southeastern Europe.